The latest technology, the BEST photobooth available in the world today ! TouchScreen technology - Photographs in 6 seconds for your guests to take away - USB stick with all of the events photos for you ! Weddings, Birthdays, Engagements, Anniversaries, House Parties, BBQs and Garden Parties, Fetes & Fayres, Re-unions, Corporate events, Christmas and more ! Elvis Presley, Bobby Darin, Ratpack and Swing tunes ! looking to hire an exceptional high quality DISCO then look no further, Smart, Reliable, all music Genres catered for, available for a minimum of 2 hours and no maximum time limit (all day and night if required). ALL OCCASSIONS CATERED FOR ! 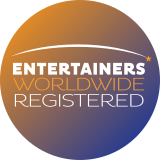 Your party is guaranteed to be a hit if you put Devereux Entertainments in charge of your event. For many years now, I have been encouraging people to have fun, and just enjoy themselves. I always find the right balance for Weddings, Birthdays. Anniversaries, Parties or Corporate events. PLEASE CALL US ON 07710 112464 TO DISCUSS YOUR REQUIREMENTS.